South Korean Foreign Minister Kang Kyung-wha is pushing for one-on-one talks with her American counterpart, Mike Pompeo, in Poland later this week, her ministry announced Tuesday, as Pyongyang and Washington plan for a second summit. 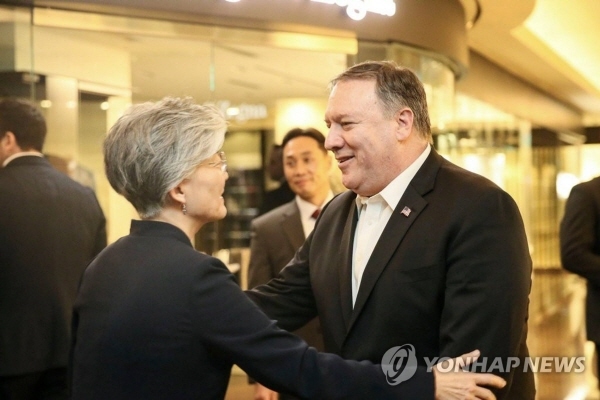 "Minister Kang is pushing for bilateral talks with (counterparts) from other participating countries, including U.S. Secretary of State Mike Pompeo," the ministry's spokesman Noh Kyu-duk said at a press briefing. If Kang and Pompeo meet each other, they will discuss issues related to a second summit between North Korean leader Kim Jong-un and President Donald Trump in Hanoi, Vietnam, on Feb. 27-28, according to Noh.